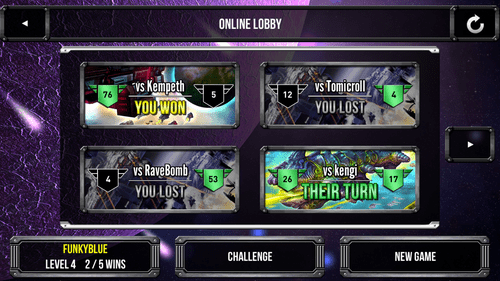 Subject: 2nd BGG Star Realms Tournament "War World"
BGG Star Realms Tournament "War World"
Tournament is over. Thank you to all participants! This is a double elimination tournament. A player is eliminated from the tournament after having two losses. Please read Terms & Rules carefully. Players have been randomly assigned to brackets. The first player in the bracket is to send Challenge to the second player in his bracket (to help with the "who-is-sending-who-request" questions). 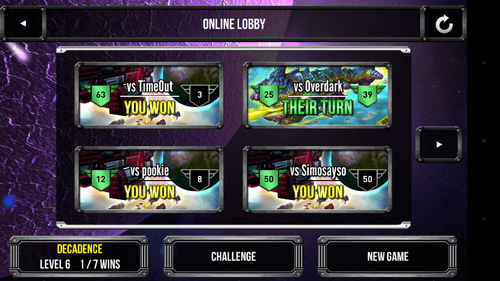 In the previous tournament, I geekmailed every player, but I can't do that, there are too many participants. If you have any questions on how to get the game started, let me know. The winner of the match is to post a screenshot (or a photo of the game screen) in this thread, and I will update the tournament bracket accordingly. I have to be able to see both screennames and the score. Please do your best to finish the matches in a timely manner, as to not hold up the tournament for other players. We have players from all over the world, from different time zones, so I am sure some games will take longer than others, and that's ok. But if there is no response from a player in over 48 hours, I might have to make a call whether to count the game as a loss to keep the tournament moving. If you are experiencing issues or delays, GeekMail me right away. Questions? Send me a GeekMail. If any of your user IDs are misspelled, notify me immediately. The entire bracket is way too huge to post above in its entirety. I will post screenshots of the most relevant brackets. I will update screenshots at least twice a day, but I will update the actual live brackets as often as I can. 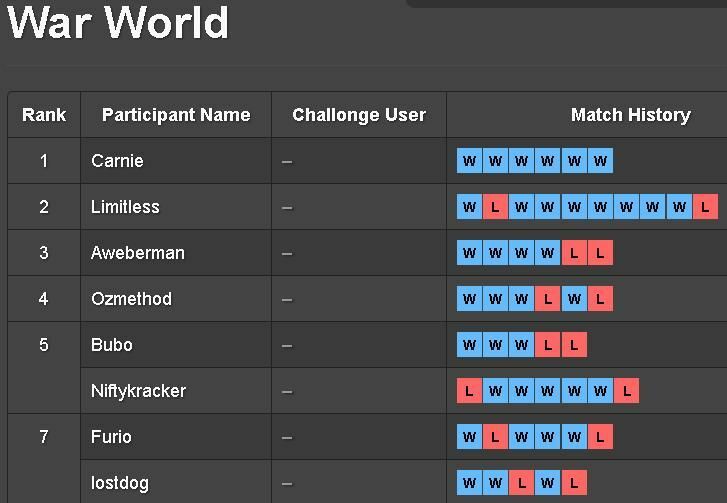 To see the most up to date standings, please go to http://challonge.com/warworld This link is also posted in the very beginning of the post. Any questions or issues before, during or after the tournament? GeekMail me right away! HEY Proposition! I've got a proposal for you! Lay down your arms before I lay the smack down. And we can begin now, right? Well, HTPKills, I can't believe it. As soon as saw you are lvl 7, I was like... what a terrible luck to be drafted against you, and until the last two turns, I was prepared for a loss. I have no idea how I pulled the last two turns off.... I got sooo lucky. what a fast and bloody match. good game! I won against Digter, but it was a very close thing at the end. He skillfully delayed the end by utilizing two lucky outposts coupled with Trade Federation authority recovery. Good game Bubo. Your really hammered me with your Star Empire. One more turn though and I would have won! In the end, you had the superior deck and deserved to win. Good luck in your next game! I won vs Kempeth. GG was fun. The high damage cards just started rolling. But you put a good scare into me late. Good game! Carnie trounced me. Good game mate! The word "Lucky" only begins to describe my final turn. It was breathtaking to witness. Cheers. Indeed. It was a close match. One more turn and I probably would have had you. Depending on the card draw, I could have pulled off on my next turn. Darn it. Real close one. Good game man. So, if we know who our next round opponent is, can we go ahead and start the match? Or should we wait until the entire round has finished? You can. Other brackets will catch up eventually. Bracket R has been established: Aweberman vs Limitless. Remy, please feel free to send a challenge. Bracket S has been established: Bubo vs HisDudeness. Bracket AI has been established: FunkyBlue vs Kempeth. Bracket AJ has been established: digter vs LogusVile. Those are for the tournament life. Original post, and brackets updated. JUST pulled it off against Proposition. A match I thought I could lose at the last moment but for a couple of unlucky draws for him. GG Proposition! I still think it's cool that I can play someone across the world on my phone. Yes, thank you JT. GG. It was a nailbiter. I thought the luck evened out, save for the last two turns. Damn. Btw - if you ever want a rematch via SC2 I use the same nick. Thanks again! I've won my match against HisDudeness. That was a nailbiter of a good game, with HisDudeness going after an early Star Empire build. His discard abilities beat me down hard before I managed a lucky purchase of a Command Ship to complete a Machine Cult and Trade Federation engine to reverse the game. I do apologize about that last round, though. I didn't realize my attack had gotten that high until I finished playing all of the cards from my hand. I was amused by how few cards were left in my draw pile though (the discard pile had been cycled into the draw pile form card draw abilities). Good luck with the tournament all! Furio, I challenge YOU! I managed to best kempeth this morning.